Income distribution is now back to the centre of economic growth, with a broad consensus that inequality has been increasing to a worrying level which require serious policy interventions. 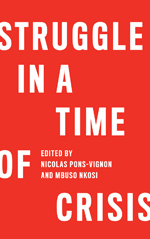 Most recently, Thomas Piketty’s book, Capital in the Twenty First Century, has offered a powerful historical reminder that income inequality has been a thorny issue with which the modern society is been struggling and that, excessive inequality, if left unaddressed, has severe social and economic consequences. Thus, the “conventional wisdom” that inequality was an inevitable by product of the structural transformation from rural/ agricultural to industrial/urban employment and that after this initial rise of inequality growth would be eventually taking care of inequality without “artificial” non-market intervention has lost its empirical ground and is now in retreat. The Kuznets curve which was once understood to embody such belief is being discredited. Trends in inequality are not automatically determined by economic growth. Rather, it is the matter of social and political choice. Paradoxically, once we move away from the “comfort zone” of the Kuznets curve, we can listen to his original message. In fact, Kuznets’ turning point beyond which inequality begins to decline is not economic. He said that the period of falling inequality was driven by “legislative interference and ‘political’ decisions” that reflected a “re-evaluation of the need for income inequalities as a source of savings for economic growth” (Kuznets 1955). And he added that these processes themselves were driven by “the growing political power of the urban lower-income groups”. With these observations, it should not come as a surprise that he called for “a shift from market economics to political and social economy” (Lee and Gerecke 2015). Then, what police choice is needed? Here, views diverge again. For instance, it is fairly common to point the fingers to redistribution policies. Recent IMF studies found that redistribution such as tax and income transfer played a major role in weakening the linkage between gross market income inequality and net income inequality (e.g. disposal income). Thus, the overall changes in the net income Gini index are smaller than those in the gross income Gini index (Ostry et al. 2014; IMF 2014). In addition, these intensified redistribution policies are found to have no significant negative impacts on economic growth. These findings are certainly important contributions to policy debates, especially in debunking the widespread myth that redistribution can damage the economy. However, these studies are mainly concerned with personal income distribution, i.e., how total income is distributed between individuals (or households). Missing is another critical dimension of income distribution which concerns how the total income is distributed between capital and labour. This is important in two respects. First, recent increases in the personal income distribution can be to a large extent explained by the shifts in the functional income distribution in favour of capital, or falling labour income share (see Charpe et al. 2014). As is illustrated in the figure below, a significant reduction in the labour income share up to the 2000s in G 20 countries coincided with a large increase in both market and net income Gini indexes. The difference between the two Gini indexes has been surprisingly stable, as has recently been recognized even by the IMF studies. 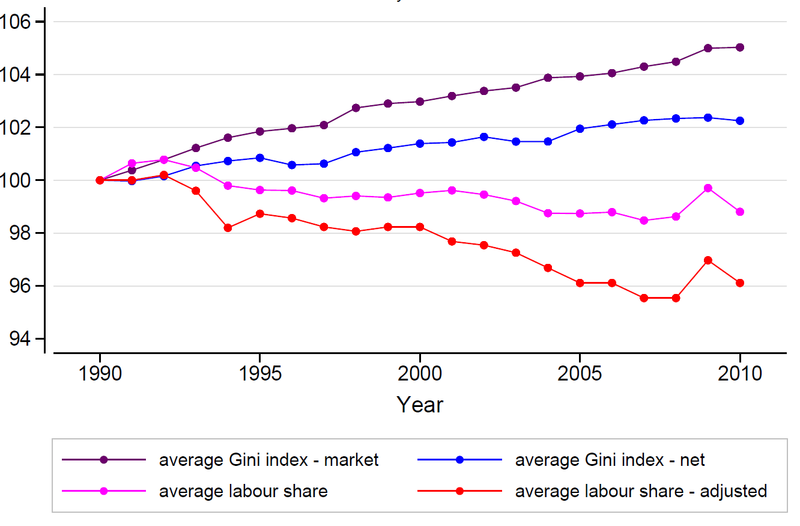 It is estimated that one per cent reduction in the labour income share would lead to a range of 0.1 to 0.2 per cent increase in the market income Gini index, subject to estimation methods. These findings are at odds with the standard structural adjustment recommendations that suggest to have primary income distribution to be determined by unregulated market forces and deal with unwarranted social consequences through redistribution policies. Indeed the crucial role of functional income distribution for overall level of inequality has an important policy implication. Redistribution policies alone would not be effective in reducing inequality, unless they are accompanied by policies which could influence the functional income distribution. In this situation, redistribution policy might end up shooting a moving target. Furthermore, the failure to address the declining trend of labour income share would increase the costs of redistribution to keep personal income inequality at a sustainable or acceptable level. It may also create a difficult situation in which the growing costs relating to redistribution would be used as an easy excuse for weakening or even dismantling the social protection system. Therefore, the Kuznetsian turning point ought to begin within the labour market, more specifically by rebalancing bargaining power at work. The strategy of wage moderation which is very much alive among policy circles would be a recipe to a slow economic recovery with uncertain future. As Kuznets said, it is time for “re-evaluation of the need for income inequalities as a source of savings for economic growth”. Such “re-evaluation” has been offered by a growing body of literature which shows that a falling labour income share tends to lead to a reduction in consumption and that, in most countries, the resulting shortfall in the aggregate demand not fully compensated by an increase in investment and net export (Charpe et al. 2014; ILO 2013; Lavoie and Stockhammer eds. 2013). In this sense, higher “savings” for capital cannot be a source of economic growth. Thus, it is now high time to turn the wheel with what Kuznets called “legislative interference and ‘political’ decisions”. As the Kuznetsian turning point is determined by the distribution of political forces in a society, there is no guarantee that what’s good for society at large becomes also a reality. But understanding that constantly growing and extreme levels of inequality are not only socially undesirable but also dysfunctional for sustainable growth is a good start for turning the discourse. Sangheon Lee is the Special Advisor to the Deputy Director for Policy of the International Labour Office. He received his PhD in Economics from the University of Cambridge, UK. Charpe, M., Lee, S., Arias, D., and Bridji, S. 2014, “Does income distribution matter for development?”, in ILO World of Work Report 2014: Developing with Jobs, Geneva: ILO, Chapter 8. Kuznets, S. (1955), Economic growth and income inequality, American Economic Review, 45, 1–28.